A nifty little product, not only are bar mats or runners are a great way for your brand or logo to be seen by your target audience, but they're also great at soaking in any spills from your beverage of choice. This is probably the single most important component, Nitrile Rubber classified as a food grade rubber and does not contain any impurities, it is resistant to Oil, Grease, Bleach and most chemicals. It has the highest none slip rating and is guaranteed to always lay flat, not curl up, crack, or smell and stain the floor underneath. These printed bar mats are also UV resistant Nitrile Rubber Bar Mats is the only rubber that can be commercially washed, this means you can, if required, wash the mats in a washing machine (under 40 degrees Celsius). As you will have seen from the pictures, there is no limitation on colours or design, and we can produce to photographic quality. Our dye sublimation processes use ink saturation to ensure your image is not just on the surface but is transferred deep into the fabric, this ensures your image will not wear away and stay in use longer. 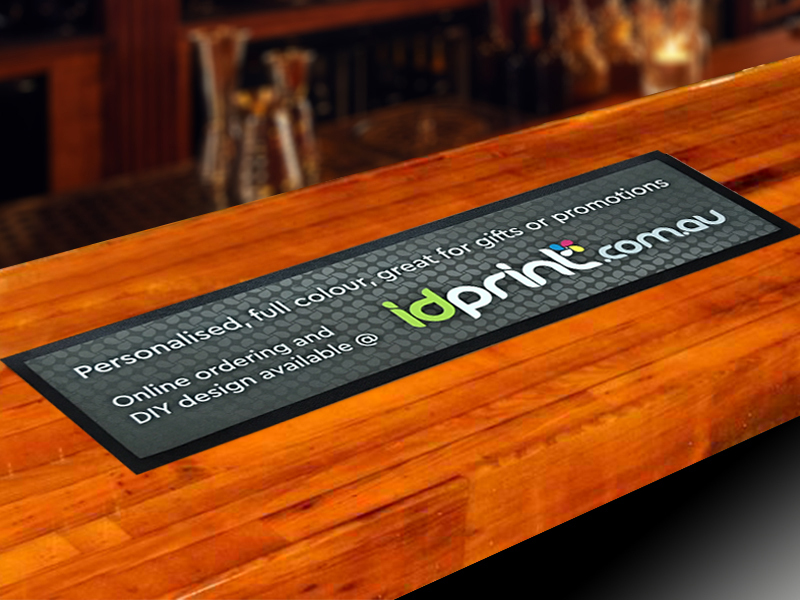 Our custom printed bar mats or runners are made with a fully washable, absorbent, non-woven polyester fabric top and a non-slip rubber base. They are printed in full colour allowing for clear and vibrant images, the only way to showcase and market your brand.